Spent the past couple of days at our state Memo Conference learning from leaders from all over our state and nation! While there was a tremendous amount of sessions to choose from, I decided to focus on sessions that revolved around 1:1, BYOD, Flipped Learning, and anything iPad. Within each of these sessions, I also asked alot of questions – specifically in the area of professional development. We are at a cross road in our district. We currently have a BYOD at our high school, but we also have a 1:1 iPad pilot in our 7th grade. From my observation, the iPad project has not only been embraced more by our teachers and students but it also appears to be far more transformative than the BYOD project. Yet, when I heard other districts share their BYOD stories – I had to make my own comparisons. What did we miss? I knew teacher training was an issue in the BYOD program – probably because there was none. Staff were left to figure it out on their own. 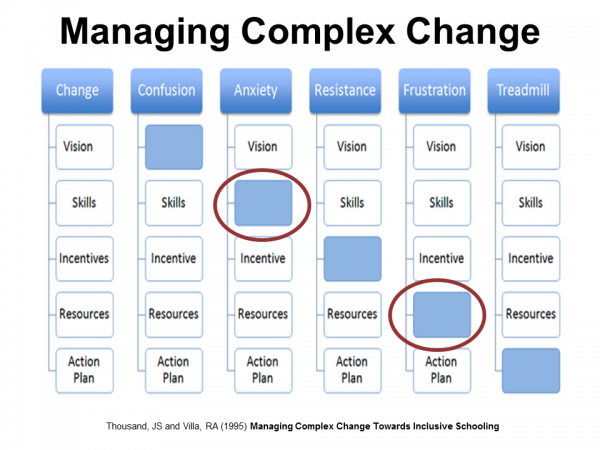 The next day, I attended another BYOD session in which the presenters (Josh Swanson and Jennifer Wykle) shared a slide for managing complex change. It was a lightbulb moment. I could pretty much plug every complex initiative we have ever had into the table and recognize when we did something well, all of the areas under the “change” box were sufficient. Yet, I could also plug in others – that were not so successful or were very slow moving (including BYOD) and pinpoint the main issue. I also heard many not so happy stories from audience members who were really struggling in their districts. By far, frustration was very common. Below are comments that I heard. We do not have adequate technical support. One of the things that I have done during our 1:1 initiative, is to meet weekly with our teachers. This has been very helpful – especially when considering expanding 1:1 to future grade levels. When we meet, we first discuss wins – Some of which are exciting and game changing for our teachers and students! We also discuss challenges. I need to LISTEN. How can I help remove the road blocks? Sometimes it is a process issue and other times it is working with the staff to come up with work-arounds or even new solutions. As the weeks go by, it seems we are talking more wins than challenges – and it is necessary to provide our staff with the resources to be successful. Florida Technology Integration Matrix – Use this to assess our projects/classrooms? SAMR – The model allows educators to select appropriate tools, plan their usage, and design metrics for results as part of a single integrated process. 10 minute sessions. – I was thinking of doing APPY Tuesday. Introduce an app with examples/samples of how to use – including workflow. This could also be flipped! All keynoters for the conference had developed an extensive PLN using Twitter and other tools. (Shannon Miller, Kathy Schrock, and Gail Lovely – learned soooo much from these individuals) I need NEED to spread and encourage TWITTER (first) to more of our teachers and administrators. I want to first start with my digital learning coaches – and then move to the rest of the staff. I love Twitter and have had some fantastic learning opportunities and discussions because of it! Not only is it cheaper than formal learning (see below) it is also very personalized and will allow our staff to connect with other educators, authors, experts all over the globe! Which could, in turn, give our students some global experiences! This entry was posted in 21stCentruy, Best Practice, Professional Development, Technology Learning. Bookmark the permalink. I’ve been considering the same things in my new district. I hate delivering and going to after school PD, because no one shows and it’s already been a long day. This is consistent between both my old and current district. We’re moving forward with aspects of Kristin’s flipped model, then moving toward PLNs. Excited about it. I had gotten to a point where I was pretty jaded w PD, so I needed to try something new. We have also incorporated the flipped PD model in my district. It is going extremely well. Every teacher (preK-12) has an individualized learning plan. We are now in the stage where coaches are developing flipped resources for our staff. The problem we have is that my coaches are full time teachers and we will only be able to schedule meetings monthly with teachers. (these monthly meetings are DURING the school day and we will utilize substitute teachers to relieve our staff) This is quite an improvement from years past, but I still feel we need to do more. I like the idea of informal learning and videos is a great way to spread the message! Thanks for your reply! Really nice to see you at MEMO. I was pretty impressed with the conference and its sessions. My goal in our district has been moving all teachers forward. I am a little tired of the “pockets of WOW” technology use that we’ve been experiencing. I love the early adopters, but I want more than just a hand full of great tech users. So my focus has been looking at teacher evaluations, minimum tech competencies for teachers, and common expectations of tech use. Not as much fun, but personally, I think more important. Keep sharing on your blog, my friend. I draw inspiration from you. Thank you for your kind words Doug! Love your pockets of Wow. I actually called it pockets of innovation but I like your idea MUCH better. I have noticed the gap between the tech/non tech savvy teachers is increasing at a very large rate. We have a similar mission… to address the edtech skills of all staff preK-12. I like the idea of minimum tech competencies. Are you using the TPACK or SAMR model? I also feel it is important that all new hires are equipped with these skills and right now I am not even sure what edtech questions are asked and evaluated (by admin/teams) when we hire new teachers. Do they know what today’s tech savvy teacher looks like? Would also be great if new teachers would provide artifacts of their students to prove their knowledge of 21st century skills. Maybe require ePortfolios! Good luck – I am sure we will be in touch!